RICHMOND (November 15, 2018) – Attorney General Mark R. Herring today unveiled a package of legislation to protect Virginians from the rise in hate crimes and white supremacist violence occurring in Virginia and around the country. Attorney General Herring’s bills will update the Commonwealth’s hate crime and domestic terrorism laws, protect Virginians from violence and intimidation by hate groups and white supremacists, and make it harder for hate groups and white supremacists to threaten, intimidate, or hurt Virginians with firearms. 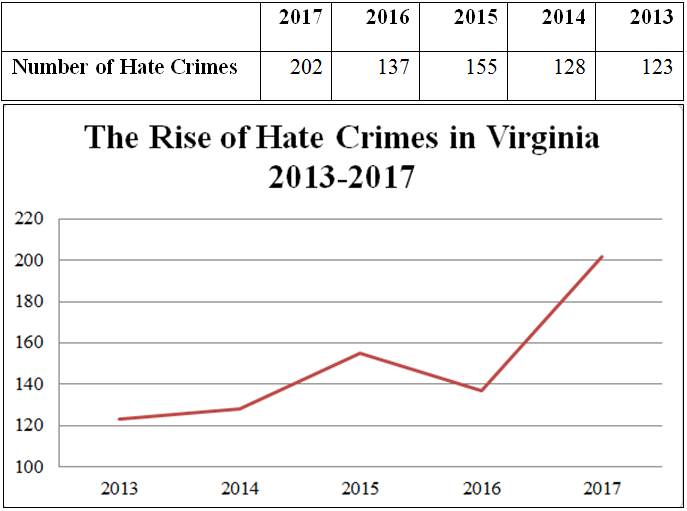 Over the last 5 years, hate crimes in Virginia have risen by about 65 percent, and in 2017 alone, hate crimes increased by nearly 50 percent. “In Virginia and across the country we are seeing hate turn deadly with frightening frequency. It is well past time to acknowledge the threat posed by hate and white supremacist violence and take action to stop it,” said Attorney General Herring. “We have to make it absolutely clear that white supremacist and extremist violence will not be tolerated in Virginia, and we need to do more than just say it. We have to pair our words with action. We must give our law enforcement agencies the tools they need to identify and prevent acts of violence and threats to our communities, and we must make it clear to vulnerable communities that they will be protected and cared for because they are important parts of our Virginia family. “Over the past several sessions I have introduced legislation to address the rise in hate crimes and white supremacist violence, but nothing has been done and the threat continues to grow. That must end. A recently released report from the Virginia State Police shows that hate crimes in Virginia rose by nearly 50 percent from 2016 to 2017. Over the last 5 years, hate crimes in Virginia have risen by about 65 percent. Last year there were a total of 202 hate crimes in the state, including 38 racially-motivated assaults, 44 racially-motivated acts of vandalism/property destruction, and 32 acts of religious-motivated vandalism/property destruction. This week the FBI came out with its annual Hate Crimes Statistics report showing that, not only were hate crimes on the rise, but so was the number of law enforcement agencies around the country that reported hate crimes having occurred. In 2017, law enforcement agencies reported 7,175 hate crimes to the FBI’s Uniform Crime Reporting Program, an increase of about 17.5% over the previous year, constituting approximately 1,000 additional hate crimes. This included about 5,000 hate crimes against persons and about 3,000 property crimes. Attorney General Herring and his team have been working with stakeholders from across the Commonwealth to develop legislation that will update hate crime laws and clearly define what constitutes a hate crime in Virginia, update domestic terrorism laws, and allow localities to decide whether firearms are permitted at events. Updating Virginia’s definition of “hate crime”: This bill will create protections against hate crimes committed on the basis of gender, sexual orientation, gender identity, or disability. Empowering the Attorney General to prosecute hate crimes: This bill will allow the Attorney General to prosecute hate crimes through the Commonwealth’s network of multijurisdictional grand juries. Prohibiting Paramilitary Activity: This bill will further restrict the kind of paramilitary activity by white supremacist militias and similar groups that was seen in Charlottesville in August 2017. Identifying and intervening in the actions of violent white supremacist and hate groups: This bill will give law enforcement agencies more tools to identify hate groups and white supremacist organizations that have perpetrated acts of violence, making it harder for these groups to operate and allowing for intervention before groups can commit planned acts of violence. Firearms at Permitted Events: This bill authorizes communities to ban firearms in a public space during a permitted event, or an event that would otherwise require a permit. Keeping guns away from those convicted of hate crimes. This bill will close a loophole and ensure that anyone convicted of a hate crime is barred from possessing a gun. Attorney General Herring has been working for years to address the rise in hate crimes and white supremacist violence. Two years ago, he launched www.NoHateVA.com to give vulnerable communities more information and resources, and introduced legislation to update the definition of hate crime to include gender, gender identity, and sexual orientation, and asked the General Assembly for authority to prosecute hate crimes. Last year, he had two bills in the wake of the violence in Charlottesville to combat white supremacist gangs and militias that commit acts of violence and intimidation.